the damage at BP Plc's (BP) giant Gulf of Mexico Thunder Horse platform in the wake of Hurricane Dennis will defer for at least 3-6 months 25,000-45,000 barrels a day of oil that was supposed to hit world oil markets late this year, according to Pickering Energy Partners, a Houston energy research firm. Thunder Horse, the largest oil and gas discovery in the history of the Gulf of Mexico, has been built to reach peak production of 200,000 barrels of oil and 200 million cubic feet of natural gas per day. The massive project is currently being installed in a remote area of the Gulf of Mexico, and was supposed to hit first oil in the third or fourth quarter of 2005. Original post: Well before I get back to some more thoughts on drilling holes in the ground, I would like to bring forward a note that Mike Watkins drew attention to in the comments on the hurricane. It appears that the Thunder Horse platform (the black dot in this graphic), suffered some damage due to Dennis (thanks to J for the photos, who says: "To get an idea of the size of this thing, each of the orange lifeboats you see can hold about 65 men crammed tightly, if I remember correctly..."). There is a photo here too, but the Reuters story quotes BP as saying that the 20 â€“ 30 degree list may be just due to excess water in the ballast tanks, rather than any major structural damage. (Which may be good since Emily is already on her way). Interestingly, at the time Thunder Horse was dedicated there were comments that it was a safer design than some alternatives. 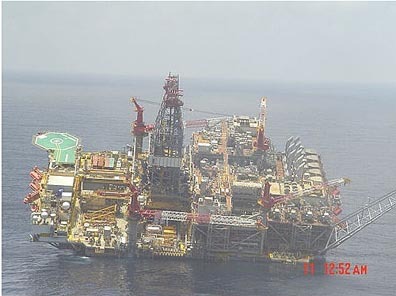 The Minerals Management Service (the federal agency that regulates drilling, issues leases and collects royalties for the government) is currently reviewing industry construction and operation standards for offshore platforms because of severe damage last September from Hurricane Ivan, the worst ever for the industry in the oil and gas-rich producing area. 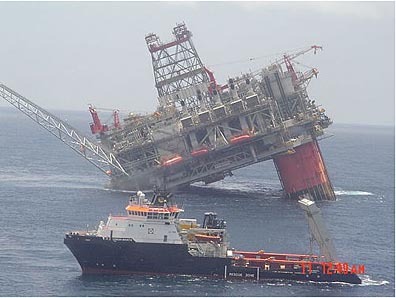 Mercier said floating platforms fared pretty well during the storm, but some fixed rigs suffered damage. He said the worst damage was to underwater pipelines from mudslides. Companies are still working to repair about nine platforms that remain out of production. Work is also under way on pipelines with a June 1 deadline imposed by the MMS. The devastation from Ivan could have been even worse if it had taken a course through the western gulf, where the oil and gas production is more widespread, Trahan said. To prevent overboard water discharges, the water produced by the platform will be mixed with sea water and re-injected for reservoir pressure maintenance, officials said. In fact I suspect that a lot more of the material that an oilwell generates as waste, cuttings, extra cement and other fluids will also end up being re-injected into the ground deep beneath the platform. By pressurizing a dedicated well to the point that the rock cracks around the hole, it is possible to create some space in that rock, well below levels where it might create problems. By pumping the waste into these cracks, the oil companies can minimize the total impact of the drilling on the local environment, even in very sensitive locations. It is a technique used in the North Slope and North Sea fields and is a planned answer to those who are concerned that the development of Sakhalin Island oil field might otherwise generate significant local contamination. The technique has gained in popularity recently, and repeated cycling of the pressure within the well can lead to a family of cracks being generated and opened that can contain all the volumes of unwanted materials that might otherwise create problems. The cracks are located in a rock that can be expected to hold the material essentially in perpetuity. It does not however impact the issue of the gray whale population , another problem that they have at that site. This idea of cracking the ground is also fairly old news, since it is one of the ways in which a poorly performing well can be encouraged to perform more effectively. It is, for example, being used in Ft Worth to make the Barnett Shale there a highly productive new source of gas . As referenced earlier , this is making some locals there a little more comfortably off. But it requires that the rock be cracked allow the gas to flow from the rock, since naturally it will not release hardly any gas. Finding the optimum fracture techniques was critical to the Barnett play since average permeability is in the nano-darcies and porosity averages between 5 and 6 percent," Bowker said. "Matrix permeability is nil, but we hope for permeability along the fractures." The typical fracture stimulation today consists of a million gallons of water and 50,000 pounds of sand to create a theoretical zone of fracturing that is about 1,500 feet long in both directions, for a total length of 3,000 feet. Average cumulative production from the initial fracture stimulation is 1.25 billion cubic feet of gas per well. The wells initially produce for about one million cubic feet of gas per day but experience a 50 percent decline in the first year. Then the wells stabilize and produce for an average 20 years, with expected life in excess of 30 years. Of course, when they crack this far from the original well, you have to wonder if all the neighbors are aware that the crack might be growing under their house too. But that requires that they know where all the cracks grow, and that is a little more tricky. I'm curious about doing very extensive fraccing around long multilateral wells. If the goal is to get a sizeable amount of hydrocarbons out of rock that otherwise had negligible permeablity, it seems like they must have to really work it over. That must have a pretty major impact on the strength of the rock layer. If the rock layer was under much stress, it's ability to resist that stress goes down. Could this be an issue with earth tremors, subsidence, etc? I don't think that they hydrofrac around multipaterals. The techniques are separate and deal with different types of rock. Generally with a hydrofrac the structure of the rock does not change other than along the crack and the crack is filled with a sand that can carry the stress of the surrounding rock and hold the crack open. The stress around the area still redistributes to a degree but as a general rule this will not by itself lead to earth tremors or subsidence. Injecting fluid can have some effect on lubricating faults and causing some small earth tremors (I think there was an example in Colorado about 20 years ago) but it may mitigate earthquakes that might otherwise have been of much greater size at some later time. Having worked as a Barge Enginer on a drilling rig and FPSO, I can tell you that hurricane evacuation is problematic for floating rigs, especially a newly commissioned one like Thunder Horse. I did some consulting work for this project, and I am familiar with the great lengths that BP and Pride management went to in the building and design of this structure, However, it only takes a single guy who doesn't understand to make things bad. In evac for a hurricane offshore Brazil 20 years ago, we left for a few days. When we got back, the rig was listing at 20-30 degrees like TH. I was the guy who volunteered to go on board with the anchor chains popping and the rig groaning under the stress and fire the engines and generators up. The final culprit was a small 4" valve that had been installed backwards - when the power was shut off, it was supposed to close. Installed backwards, it opened and let ballast water move in the wrong direction - hence the potentially deadly listing. All the planning in the world cannot eliminate human error, and something as simple as wiring a small valve backwards or installing it backwards can sink a rig when nobody is on board to counteract it. One guy who doesn't get it and is mentally clicking off his days of pay rather than paying attention can actually kill people or cause millions in damage. One guy told to install a valve and not told that it needs to be oriented correctly could have caused this. A single leaky valve or something (rag, small piece of wire, etc.) blocking full closure can do the same thing. Frac jobs are done on all kinds of wells - from tight gas sands to tight multi-lateral horizontals. We can calculate the effects beforehand and control them very well using pressure, fluid density and time for the process. I am only aware of a very few instances where a frac job caused problems - these were very shallow wells (less than 5000 feet). In one instance, the frac propagated into local fresh water. This well was cemented shut immediately. The proppants we use are engineered sands - not something either inexpensive or simple, as they must hold the fractures open and allow fluid to migrate. The biggest issue we run into is the fracture propagating upward along the cement that holds the casing (pipe) in the ground. Multiple frac jobs can weaken this cement, and we usually do what is called a cement "squeeze job" on the casing nearby, to insure the integrity of this cement prior to a major frac attempt. A few wells have seen casing rupture and deformation in seismically active areas. It is impossible to tell what actually caused the earth movement, but when you consider the forces involved, a small hole (niormally much less than 9" in diameter) drilled into any local rock structure is just too tiny to precipitate massive earth movement. What we do is more like a pinprick in a 400 pound pumpkin - it is just such a small and localized hole that it is inconsequential. And most earthquakes are igneous rocks slipping past each other - we are normally working in the overlying sedimentary rocks where the oil is trapped. We just aren't deep enough to effect much in the way of earth movements. Blaming oil production for massive subsidence is not logical - we replace the fluids we extract. Fluids are not compressible, so there is no appreciable subsidence from producing oil. Our normal practice of secondary saltwater injection to drive the oil out maintains the structural integrity of the producing rock - we just replace oil with water, but both are incompressible fluids. Coastal Louisiana is no exception - oil companies are not causing subsidence by production. The Army Corps of Engineers should be blamed for disrupting the natural renewal sustem of the Louisian marshes vis a vis the Mississippi Levee System. Disallowing natural flooding allows the depletion of the marsh sediment by tidal and wave action, without replenishing them as the river has done for millions of years prior to Corps of Engineer intervention. Wow, thanks for the information J. The Mississippi could have it's own blog, I think, to discuss pros and cons of what has been done over the years. Does anyone know where can we find the status of Thunder Horse (for those of us that are curious)? I just emailed two photos to the guys running this blog which were taken by BP hands yesterday from helicopters. I was googling a bit about the rig and it seems to be a marvel. J - Thanks for the info and photo's. I stand corrected. No word yet on what happened or how they will fix it, they think it's stable and will try to get someone onboard soon. This rig is most definitely state-of-the-art, and you simply cannot grasp how big this thing is until you actually stand on the dock next to it. A man standing next to the crew quarters looks like an ant - if you don't squint, you will simply not be able to make out it is a man. And HO - you are so much more knowledgable than the outsiders I usually deal with. Don't sweat the small stuff - you got the big picture and lots of the details down. Which should be a big red flag, even at an economists convention! Isn't saying the rig is fine except for some excess water akin to saying the Titanic was perfect except for the hole? No - the ballast compartments are normally not linked. If she stabilized in the position seen in the photos, then they can pump her out once they get some hoses into the water inside her structure. They were lucky that the water coming in flooded the entire port pontoon. That way, the rig simply leaned over quite a bit. Bear in mind that you are only looking at half of the length of the legs showing above the water on the starboard side. There is a pontoon below each leg for flotation, and she normally sits half submerged. So she is listing badly, but most of her is under water. That actually helped keep her from flipping with that huge deckload you see. If all the water had gone to either the front or the rear of a pontoon, this would have likely capsized her, as one corner would have pulled down, the opposite reared up, and eventually the anchor cables might have popped under the extreme loading. Once they pump her out, they will have to change out any electrical motors and other junk fouled by seawater, fix anything that slid or moved with the tilting, and they should be back in business. But who knows what this did to the anchor pilings, cables, flowlines from the wells, etc. It is the damage to the subsea production stuff that could be really bad, and everything will have to be looked over and inspected by ROV cameras or saturation divers. Interesting re the platform. Is 5 - 7 days enough time for them to get sufficient work done in time to batten down for the next storm? Given the potential for disaster and lost costs I would imagine they will be doing everything possible to beat the clock. By Sunday or so there'll be another round of evac orders for the Gulf. While its still very early days, the track for Emily is so far looking more like Ivan than Dennis. Commentary from NOAA suggests the so-called cold wake effect may be working against the norm with Dennis possibly may have moved warmer, not colder, water in the potential path of Emily. In case anyone missed this, Emily marks a new all time record for number of named storms this early in the year. After reading "Twighlight In The Desert" I was left with the feeling that I now know far more about Saudi Oil wells than I ever wanted, yet far less about oil drilling in general than I'd like to know. Can you point to a book or online resource that would drill down (sorry!) into the subject? I have no plans for a career in the industry, but I think it would be fascinating to learn how the bits work, how they make turns for horizontal drilling, how they control and measure position, what are the steps to lining the hole, cementing, bottle-brush drilling, and so on. Seriously - when I was in college, the Intro to Petroleum textbook was so lame that I didn't even buy it - I just skimmed it in the bookstore. It was completely dated in 1976, and it is still being used today. Why? Nobody is entering the field anymore, much less writing textbooks. Every time there was an industry downturn, another college closed the PE or geology department to save bucks. There are less than 15 colleges offering this degree worldwide today. If you want to get up to speed, you can read the propaganda on any of the major websites, like Baker-Hughes, Halliburton, Schlumberger and even some of the operators. The SPE website and Oil & Gas Journal sites also have a fair amount of stuff. It is such a huge investment for the industry to lose that we cannot even imagine the consequences. Sure - it's insured. But crews have been training for well over a year just to handle all the systems on this baby. Even though they are a competitor, nobody wishes them anything but luck in getting things sorted out and keeping this baby afloat and working. on how to drill an oil well. There are a lot of alternatives to what they talk about but it gives a relatively simple idea of the techniques. In all cases I ended up saying yes, but . . . . however they will give you a start with some of the terms. If I remember as we post on I'll try and include more references to some of the basic ideas I am talking about. I should have remembered that they already did their homework! Latest scuttlebutt (aside from a false rumor she sank at 2pm today) is that one of the big anchor winches slipped overboard. This may mean a really tough time securing her for Eddie, as there is no way to pull a strain on the anchor pilings without an anchor winch. It is likely they have a spare or can get one that they can make-do with in a few days. Then they can weld and bolt it down, hopefully enough to grab some tension and keep her in position. The issue farther out is exactly what the winch may have hit among all the subsea stuff installed 6000 feet below. So is the new storm Eddie or Emily? Hope they get it squared away and soon. A Reuters story this morning said that BP didn't think the winch was the culprit, as it went overboard 36 hours before the crew left, and no tilt was detected before evacuation. I didn't mean it was the culprit. And that they still have to look on the sea floor to see if the winch damaged any of the subsea wellheads or other equipment. Hurricane Dennis, which abated somewhat as it made landfall in Florida may have done its worst damage offshore as it rampaged through oil well platforms, according to a knowledgeable insurance broker. Bruce Jefferis, a managing director of Aon Natural Resources in Houston, said there is concern that Dennis, which was clocked at a category four hurricane with winds approaching 140 mph, could have done significant damage to the Gulf Coast energy infrastructure. The huge Thunder Horse platform was reportedly listing 30 degrees and could be in some trouble, he said. Mr. Jefferis added that it is too early to tell how badly damaged it is or what would be done to repair the platform. What will happen to it, we dont know; they will probably right it, but [if they cant] it could make for a big loss to the market, Mr. Jefferis observed. Last seasons hurricane Ivan, which was the costliest hurricane in history, resulted in $2.5 billion in total insured losses for energy insurers, he said. Like Ivan, there may appear to be little damage to oil platforms and riggings, but pipeline damage from undersea shifts in terrain could be another story. Dennis took a similar path to Ivan, but a little further East, which is good, said Mr. Jefferis, noting that the further West a storm comes the closer it is to the bulk of the oil fields. It will be a few more days before we know the initial impact of Dennis on the properties, and maybe a few months before we really know the extent of the damage, Mr. Jefferis explained. The major problem in determining the extent of damage is that much of the damage could be undersea. Inspection requires diving equipment, which is in limited supply. One lesson for insurers coming out of Ivan is that the extent of connectivity between oil rigs and platforms through undersea pipelines was missed by both clients and underwriters. It was not understood as well and appreciated, he said. Since Ivan, there is now greater focus and understanding on the ripple effect from a damaged pipeline, both in terms of avoiding business interruptions and in forecasting the loss scenarios. While capacity remains in the [insurance] market [for energy risks] since Ivan, energy production risks have not seen a softening in pricing, Mr. Jefferis noted. Good risks have seen a 20 percent increase in premiums, and clients with large losses have seen significant increases. I see what you're saying, J. Thanks. In the GOM (Gulf of Mexico) we have a continental shelf that extends out about 100 miles. Water depth here is shallow enough for jackup rigs (less than 250'). Then we have the continental slope, which is a fairly steep dive from 250' to thousands of feet. This is the area for deepwater exploration, strcitly the realm of semi-submersible rigs (like Thunder Horse) and drillships. The Gorilla rigs work the actual slope in between these two zones. Pipelines have to cross ravines and run up the slope from the deep water zone. This slope is composed of very fine sediments, and there are numerous oil and gas seeps along with water seeps on the slope. Parts of it are unstable, and slip down in subsea landslides just like California houses do when it gets wet. With the increase in deepwater production, exposure to these subsea landslides has become a real issue, and our insurance rates have all shot up to cover the increased risks. We also routinely map the seafloor bottom to try and use lower gradients for pipeline runs. FWIW, it looks like Emily will pass pretty wide of this rig. Still early, but the high pressure over florida seems to be steering the storm toward the Yucatan and beyond. J - any idea on how long it will take to assess damage to the infrastructure (pipelines, etc) from Dennis? Is this a days or a weeks thing? weeks/months - takes ROV equipment and divers, both of which are in very short supply. We still haven't repaired everything from last year! Emily now upgraded to Hurricane, cat one. The track has changed fairly radically compared to earlier model predictions. To my untrained eye the system has been growing in size... lets see what happens tomorrow in the Caribbean sea. There was also speculation among offshore industry engineers that the rig might sink, a fate that has befallen other semi-submersible rigs over the years, most recently Petrobras' huge P-36 production platform that went down off Brazil in 2001 following an onboard explosion. "At present time no link has been established between the hurricane and the damage to the Thunder Horse facility," the service said in a news release. A researcher said the platform probably was smacked with "some very large waves." Vijay Panchang, department head of maritime systems engineering at Texas A&M-Galveston, said his buoy analysis showed Dennis mustered 60-foot waves on Sunday afternoon. I don't think the hurricane did anything other than force personnel off, and the rest was something installed incorrectly, blocked open, etc. It could even have been a software glitch in the ballast system! Remember, this thing just left the shipyard, and was basically getting the kinks out while they drilled the first well. There is an Mpeg of the rig taken by the coast guard on Tuesday.